Being able to draw your readers in, just by the article title can be a challenge in itself. Whatever you put out there it, it's always going to be connected to you. 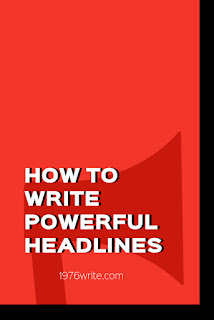 To be a successful writer, understanding the importance of a good headline is paramount. And taking shortcuts in this particular area of writing, doesn't apply. The first thing someone will see before they set eyes on your article is the headline. If your article headline doesn't pop on first reading, your blog post won't be read by as many people as you would like. Your headline should reflect your article, so don't offer 10 steps, when you're headline says 15. Your readers trust that your headline says exactly what it's going to do. Don't go overboard in your delivery, too much overselling can be disastrous. To put it simply, make it pop, and have fun with your headline. Finding the right balance takes time. Look at other writers and see how they create headlines. Most importantly get to know your audience and see how far you can push your own boundaries. Again do oversell, and stay on point with your title. By going to overboard, you could frighten your readers away. A headline of 70 characters or less will be seen more clearly on search engines. Your title will be cut off if it runs any longer. Best of or top 10 article titles draw in an audience faster. People like articles they can scan through quickly, and don't like to hang around when they're looking for certain information on the internet. By giving your reader a guide, in your title, they understand how much information there is to look at. The main reasons people seek out information is for help or entertainment. There's no harm in writing a humorous blog post once in a while. If your blog is attached to your business humorous posts won't bide well with your readers. Bloggers have different ways of educating their audience. People like to learn new things, by adding educational value to your headline you're more likely to get more views. Start making notes, to start the brainstorming process. Having more options will give you more scope as to what you where you want to go with with your article. Asking questions can make your headline even more appealing. People love to question things and give their own interpretation on things. It can be a very effective way of drawing your reader into, because they want to know the answer you're going to give. Search engines love keywords, adding a few in your headline will help you move up in the search engine rankings. Adding some emotional depth will make your article even more compelling, and leave your readers wanting more. Writing isn't just about being grammatically correct. A connection needs to be made between the author and the reader of the article. By adding some depth of feeling to the headline, your article will automatically become clickbait to readers. You want your headline to drip with confidence. Your readers need to be convinced that you know what you're talking about, and that the article they're reading is extraordinary, and will in some way challenge their lives. Engaging with your audience is the endgame, that's when you know you're winning the battle. I'd love to hear your thoughts about headlines in the comments section below.